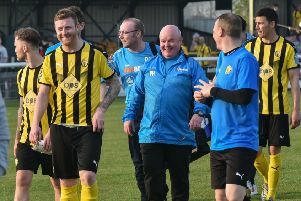 Leamington manager Paul Holleran says his side’s habit of conceding late goals is down to not being able to field a settled back four and not a lack of fitness. After succumbing to goals in the 86th and 90th minute at home to Spennymoor and an injury-time winner at Stourbridge, Brakes were again sunk in the dying seconds at Ashton on Saturday. They bounced back to beat Sutton Coldfield Town on penalties in the Birmingham Senior Cup in midweek but Holleran knows his side need to tackle an issue that is threatening to undermine a promising start to the Conference North campaign. “It wasn’t a case of them bombarding us or backs to the wall, it was another soft goal,” said Holleran, who threw James Mace straight back into the starting line-up after a three-match suspension but is still without Connor Gudger. “Without sounding like a parrot, it’s been three weeks out of four. “It’s cost us two, three, four points and an FA Cup replay. “September has been a poor month for us. “We’ve got to be mindful that we don’t want it to become a mental thing. “But the biggest point is that the back four is not settled. “Junior English has not been feeling great but we’ve not had the luxury of being able to change it. A blank weekend will give Brakes the chance to shake off a virus which has affected many of the team and Holleran knows what needs to be worked on on the training ground ahead of the home clash with Curzon on Saturday week. “The changing room is a good place at the moment and quite vibrant. We’ve not got the pressures of last year. “But I’m aware that if we don’t eradicate the problem (of conceding late goals) we can get sucked back down there. “Stourbridge and Ashton were a familiar thing, balls into the box that we would normally have dealt with.